The timepiece, a Calibre 12 Manufacture, with date, previously owned by Swedish Formula One race car driver Ronnie Peterson, sold for a record $230,000. 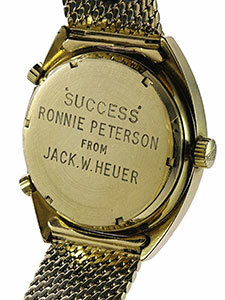 Adding to its allure is the fact that the watch was a gift to Peterson by Jack Heuer, with the words, “Success Ronnie Peterson from Jack W. Heuer” on the case, as well as the gold ingot that comes with it, commemorating the Prix Rouge et Black Joseph Siffert award bestowed upon Peterson for his performance at the 1972 German Grand Prix at Nurburgring. The Carrera model, launched in 1963, is known as the first chronograph specifically designed for professional drivers. J.R. Dunn Jewelers is proud to be an authorized retailer for Tag Heuer.